The historic landscape area of Cheriton and Burry Pill represents an area of enclosed river valley, which includes the settlement of Cheriton towards its western extent. It is thought that during the pre-Norman early medieval period this area fell within the bounds of an extensive Welsh 'maenor', which comprised the western and northern limits of Gower. The northern half of the area lay within the medieval manor of Landimore, while southern part extends into the sub-manor of Burry alias Stembridge. The whole area fell within the Welsh medieval Cwmwd of Gwyr, within the Cantref of Eginog. During the reorganisation of the post-medieval period the area formed part of the Hundred of Swansea, within the County of Glamorgan. It has been conjectured that during the early medieval period the area formed part of a much larger 'maenor', remnants of this large estate survived in a much-reduced form following dismemberment under Anglo-Norman control. It is thought that Payn de Turbeville inherited this larger Welsh unit, and that this larger holding was broken up as a result of grants to religious orders, so that by the twelfth century the manor retained only the dispersed sub-manors of Rhossili, Landimore and Llanrhidian (Draisey 2002). It is possible that Cheriton formed the former maenor's townships, moreover, it is possible that the boundaries of the later medieval manor of Llandimore, in which Cheriton was situated, may represent the continuity of a fairly ancient land division, especially given that the area fell into Anglo-Norman hands through intermarriage with local Welsh holders of the area, rather than through conquest. This is perhaps supported by the fact that the boundaries of the later manor and the parish of Cheriton make a purposeful extension to include the hillfort of the Bulwarks at the eastern end of Llanmadoc Hill; the latter no doubt gave the name Llandimore to the area. It is possible that Cheriton was the site of the original settlement of Llandimore. The early medieval Welsh dedication of the church at Cheriton to Cadoc appears to support an early pre-Norman foundation of the Cheriton site and the place name Landimore would be commensurate with a location close to the major fort of the area, the Bulwarks. A church at Llandimore is mentioned in a document called the Confirmation of Bishop Anselm dated AD 1230, but not in the Valor Ecclesiaticus; it has been conjectured that this implies destruction, but the evidence is contentious at best. 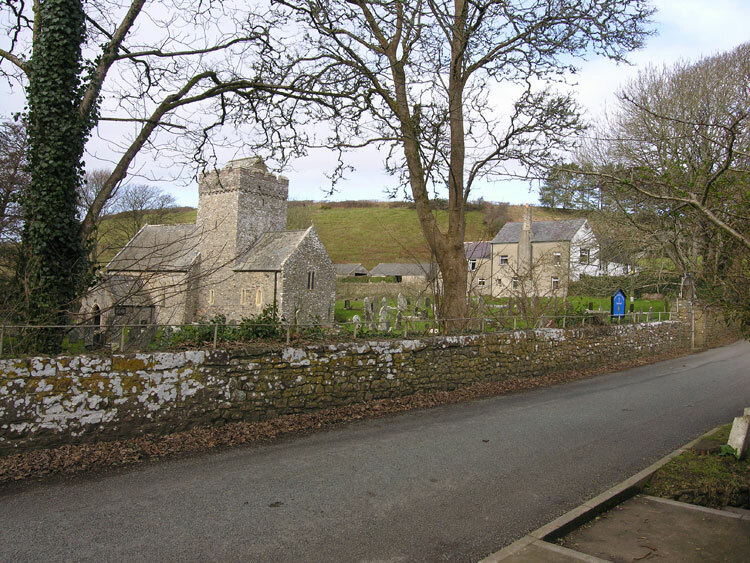 It is known that William de Turberville granted the church of Landimore, as well as those at Llanrhidian and Rhossili to the Knights Hospitallers of St John at Slebech in Pembrokeshire sometime between 1135 and 1230. It is possible that the settlement at Landimore was renamed Cheriton ('church town'), following the re-construction of the very fine Early English style church under the Hospitallers from the thirteenth century (Evans 2004). Landimore is thought to have constituted a knight's fee from the early twelfth century, probably administered from an early castle, located somewhere in the area. It is known from the Liber Niger and Liber Rubeus that William Turbeville held an unidentified knight's fee, the location of which is indicated in his grant of c.1165 to the Knights Hospitaller of churches at Landimore, Llanrhidian and Rhossili. This grant indicated a large holding extending along the north coast of Gower, broadly corresponding with the parishes of Cheriton (formerly Landimore) and the neighbouring parish of Llanrhidian, and a detached property to the south at Rhossili. The Royal Commission suggests that a castle ringwork, North Hill Tor (00093w; 305558), located on a coastal promontory to the northeast of Cheriton, may have served as the Turbeville caput (RCAHMW 2000, 444-448), however, an alternative site for this is the ringwork located at Cil Ifor, to the east near Llanrhidian (RCAHMW 1991, 117-9). In 1353 there is mention of a castle in the vill of Landimore, however the site known as Landimore Castle is occupied by the ruins of a late fifteenth century strong house which may be attributable to Sir Hugh Johnys and there is no indication of earlier fortifications occupying the site. The de Turbeville family's control of the area was interrupted when Rhys Gryg re-established Welsh control in Gower (1217-1220); until Landimore was restored to the Turbevilles, the area was held by Morgan Gam, lord of Afan. In 1353, the vill of Landymore is described as having a castle and one knight's fee, however there is no indication as the exact location of these. In 1366 the manor of Landimore had been appropriated by the Marcher lord. The southern part of the area formed part of the later medieval manor of Burry (Stembridge). It is considered that this area had much in common with Landimore (Cheriton), being in fact an alienated sub-manor, which during the twelfth century formed part of lands associated with Llangennith under the larger medieval manor of Landimore in Gower Wallicana, the successor of an even larger Welsh 'maenor' of the pre-Norman period. The claims that Burry was one of thirteen 'old knights fees' pre-dating 1135, which come from a charter of 1306 associated with William de Broes VII are now thought questionable, and more likely to reflect de Broes's territorial ambitions, rather than factual evidence (Nicholl 1936, 173; Cooper 1998, 14-17; Draisey 2002, 14-15). By the seventeenth century much of the land within the area appears to have been the property of the Cradock family of Cheriton House and Sir Edward Mansel (Draisey 2002, 109-110). In Gabriel Powell's survey of 1764 the area is recorded as being held by the Lucas family and Thomas Mansel Talbot esq. (Morris ed 2000, 47, 51). The area formerly boasted an important gentry seat, Cheriton, or Great House (00095w; 18308), which stood at the southern end of Cheriton, on the east side of the road as it rises from Cheriton Bridge. Demolished during the early nineteenth century, and no longer shown on the tithe of 1840, the house is however detailed on a map of 1753: an imposing two-storey house with an offset tall projecting gabled porch with an attic window above first floor window above an arched entrance, two window openings to the east and one to the west on each floor and a single storey end gable chimneyed extension with two windows to the east. The approach to front of the house is via a central gatehouse across a rectangular courtyard, an associated but detached building with two gable-end chimneys lies to west. The indications are that Great House was of medieval three-room cross-passage layout, or a hearth-passage chimney backing on entry house with Hall, and heated outer and inner rooms. The house was the home of the Cradock family and a relief carving of a stag and initials MC (now at Stouthall) was set within the porch, probably the initials of Morgan Cradock, owner at the beginning of the seventeenth century. The post-medieval settlement at Cheriton remained small scale from the eighteenth century to the present day. The map of 1753 depicts a small cluster of cottages to the south of the Burry Bridge, including possibly three small holdings in addition to Great House and its range of outbuildings set out in an L-shaped arrangement. To the north is a mill (Cheriton Mill, SS 45129313), and the church within its rectangular churchyard, adjacent to the northeast of which lies the L-shaped range of Glebe farm. The settlement is much the same by the mid-19th century, the main loss being Great House, the mill and a cottage to the north of Great house has also vanished, though the site is reoccupied by the time of the 1878 25-inch OS map, when also Glebe farm had undergone expansion with the addition of a further wing to produce a U-shaped plan and additional detached outbuildings. Other than this there is little notable change since the 1840s, beyond minor additions. The use of the area for milling dates back to the medieval period, when Stonemill, or 'Stomille' (24974, SS 457928), is recorded in the Minister's Accounts of 1300-1400, then tenanted by John Colyn. This mill is well documented between the sixteenth and eighteenth centuries and appears to have ceased operation by the mid-19th century, in ruins by 1879; surviving remains include the mill with millstone, weir and leat. Cheriton Mill (SS 45129313), documented in 1598 as belonging to Thomas Aubry, remained in use until the late 18th/ early 19th century, the mill's race depicted on the tithe of 1840, is named as old on the 1st edition of 1878. The area had two corn mills still in operation by the survey of 1st edition OS map of 1878: Western Mill (02128w; 24977), a 17th century mill referred to in a lease dated 1669, naming Henrie Else as tenant. Between 1719 and the nineteenth century Edward Clement and his family held Western Mill jointly with Henllys Mill, further upstream. During the nineteenth century George Thomas and the Jenkins family occupied the mill until milling ceased at the end of the century. Its substantial ruins remain. The mill at Stembridge (02123w; 24973), probably seventeenth century in date, was mentioned in the Cheriton Parish Terrier of 1720; though it ceased grinding corn around 1890, Stembridge received a new lease of life until 1925, as a woollen mill (40904), with the addition of a factory building in 1899 by Isaac Tanner of Whitemoor Mill. An additional woollen factory, the Cheriton Factory (40896), known to have been occupied by Thomas Tanner in 1844 (tithe) was run as a family cottage industry, his son, William continued weaving here until his death in 1932 (Taylor 1991, 15-18).